Click to view a complete map of the District. Download a printable PDF version of the District map. third Monday of each month at 4:00 pm. South Arapahoe Sanitation District is a Colorado quasi-municipal sanitary sewer district governed by Colorado Revised Statute Title 32. Its five member Board of Directors is elected by residents and landowners in the District. 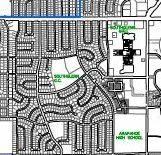 South Arapahoe Sanitation District serves over 10,000 homes and businesses in Centennial, Littleton, Greenwood Village and unincorporated Arapahoe County, Colorado. Originally formed in 1957, the District encompasses over seven square miles. Generally, the District is located between South Broadway Boulevard and South Holly Street; and between East Orchard Road and East County Line Road. South Arapahoe’s wastewater collection system includes over 100 miles of sewer lines, ranging in size from 8 inches to 36 inches in diameter, plus over 2,800 manholes. Roughly 65% of the pipelines are clay or concrete lines, while 35% are newer plastic lines. The collection lines are operating by gravity flow, and the pipes are anywhere from 6 feet to 25 feet below ground. There is one wastewater lift station in the District. Sewage from South Arapahoe Sanitation District is conveyed through a large pipeline called the Big Dry Creek Basin Interceptor to the Littleton/Englewood Wastewater Treatment plant, located near Santa Fe and Dartmouth. Here the sewage is treated to EPA standards and released into the South Platte River. To learn more about the Littleton/Englewood Wastewater Treatment Plant, see Englewood’s website at: www.englewoodgov.org/wwtp.